If the patient is Fitzpatrick 1-2 (fair skinned) then they can go ahead with the treatment on the day. If they are darker skin toned or at risk for PIH (Post inflammatory Pigmentation) then they will be advised to use topical lightening agents for 8 weeks prior to treatment. These topical agents are sold at our clinic. Consent form will be given to the patient with a discussion of risks, benefits, pros and cons of the treatment. If the patient signs the consent form, the procedure will go ahead. All makeup will be cleansed off the face. Clear ultrasound gel will be applied to the areas to be treated. 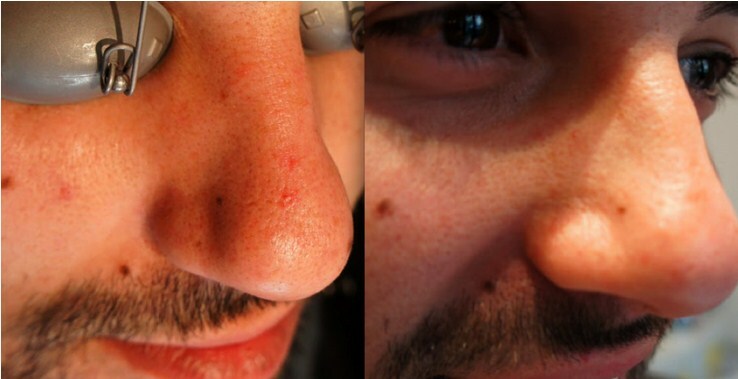 The laser will be used on each individual spot, multiple pulses may be required to ascertain the correct power. The procedure is painful, but most patients tolerate it very well. I do not like to use any form of anaesthetic when removing red spots and hemangioma as I really need to know that I am not causing excessive damage to the skin. If I use a topical anaesthetic, then the patient is not able to give me this important information, and this could lead to side effects including hypopigmentation or scarring. Also topical anaesthetic can shrink capillaries, so we do not want this when we are trying to remove thme. Typically patients will describe the pain during red spot removal as a 4/10. After the treatment, the ultrasound gel is gently cleaned off the skin. Sunscreen or makeup may be applied immediately after the treatment to the treated area. The patient may purchase a soothing gel for post laser care. Day 1 there may be redness in the treated area and darkening of the red spot, it may be purple or grey, or it may be gone completely. The sunburn-like feeling will last several hours and then nearly disappear. A hat should be worn. Soothing gel may be purchased from the clinic and used twice daily. Do not use acid or antiaging face products for 2 weeks after treatment. Please contact Dr if there is any blistering after the treatment. This is not normal and means that the power was too high. This requires treatment. Treatment 2 will be at some time from 2 weeks to 4 weeks after treatment 1. Treatment 2 will proceed exactly as treatment 1. 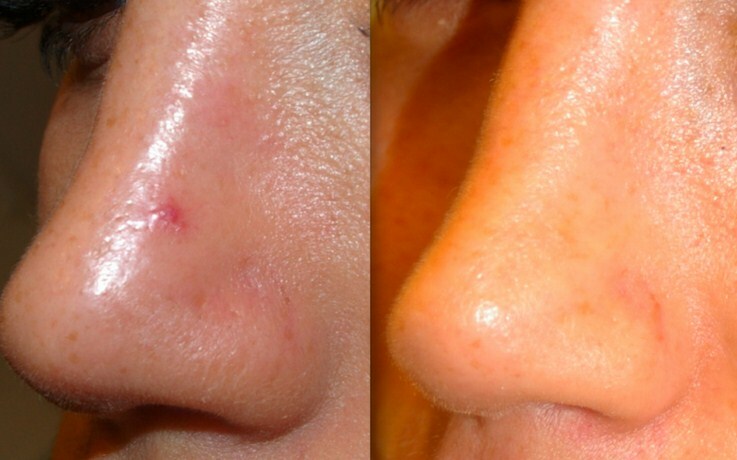 95% of patients will be delighted after 1-2 treatments of red spot removal. The 5% who are not should have a 3rd treatment, minimum 14 days after treatment 2. This can occur when the red spot is very large. Facial Swelling: this can occur especially in the under eye area is treated. This should resolve within the week. 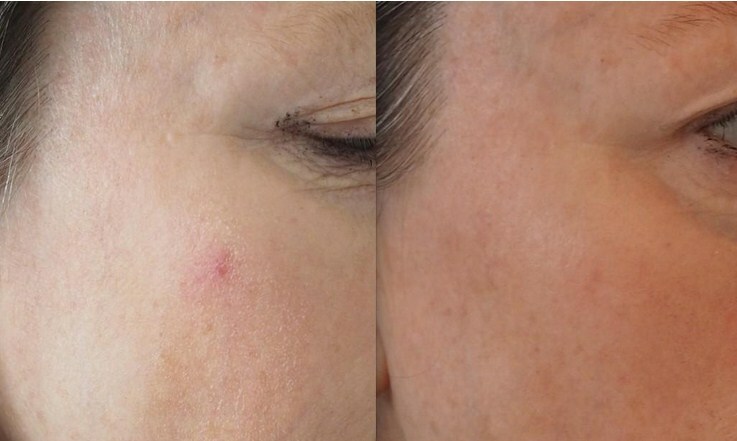 PIH (post inflammatory hyperpigmentation) ie the laser can cause areas of brown pigmentation due to inflammation and the patient’s susceptibility to this. It is less common in the lighter skin tones. Patients who are at risk for PIH are treated very differently to those who aren’t. Prevention is important, ie prelightening is important, and steroids may be necessary after the treatment. 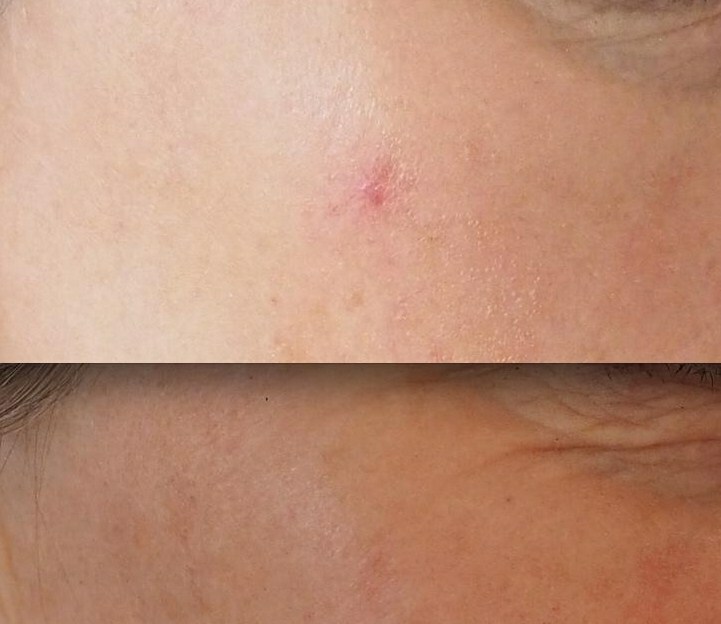 Hypopigmentation/scarring: This is very uncommon, but possible if too high powers are used.